If you have been looking for a denture then you probably have realized there are several different options. We have found that many patients who come see us for dentures are only familiar with one type of denture and do not realize there are several options to choose from. This article will explain the differences between four common dentures: immediate, conventional, flexible and snap-on. Hopefully, this will help answer some of the questions you may have. A great option and the most common, for someone who wants a great fitting denture right away would be an immediate denture. Like the name implies it is fitted immediately for the patient. The impressions are taken while the patient still has their original teeth and will be able to use the new denture right away. While the immediate denture is aesthetically pleasing for the patient it tends to fit more loosely while healing from the tooth extractions. Since the impression is taken beforehand the denture can slip or move as the gums start to heal. These dentures also require more office visits because of the adjusting that needs to be done. Finally, once the gums heal completely there is a chance that a new denture will need to be made because the old one can no longer congeal to the newly healed gums. Conventional dentures are made from a mold that is taken of the patient’s mouth after all of their teeth have been removed. In order for them to fit properly, the patient will need to wait until their gums have healed to take an impression of their mouth. This impression will later be used when constructing their dentures. Making the dentures can take several weeks once the impressions come back, which make conventional dentures a lengthy option. The advantage to conventional dentures is that when finished the dentures will fit very well in your mouth. This is due in large part to waiting until the gums heal before taking impressions. Another option is known as a flexible denture. 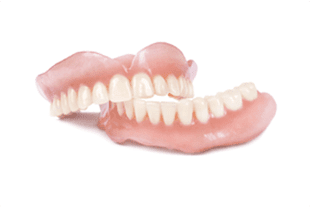 Rather than an acrylic or metal base, the flexible dentures are made out of nylon. Due to this material, it is also less prone to breakage than their conventional counterparts. They feel more natural to wear and cling to the gums so adhesives are rarely necessary. The material is also clear which allows for the natural color of the gum to show through. They also don’t take as long to manufacture as the others which means you can be back to smiling much faster! The downside to these is they are more prone to tissue irritation because of its soft base. Snap-on dentures or implant supported dentures also do not require adhesives. 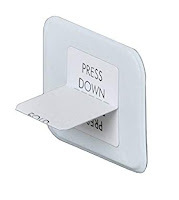 They are held in place by implants and can be easily snapped in and out by the user. The downside to this type of denture is it takes significantly longer for the entire denture process due in large part to the necessary implants. However, they will have a much tighter fit and more secure when finished and will not slip on your gum line. If you or a loved one are in need of dentures there are several options for you to choose from. At Jackson Family Dentistry we can discuss all of your options with you and find a tailored plan that works with both your budget and your overall needs. Everyone has different denture needs and not every denture will work for everyone. Jackson Family Dentistry will help you find a denture that is right for you.